“I loved your work on ‘Lateralus. 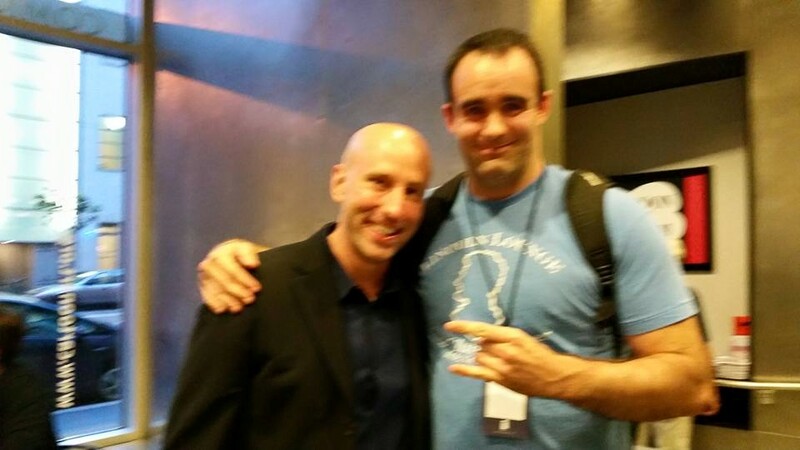 '” Brian K. Vaughan and I. This photo was taken with my phone by another attendee at the expo. Brian K Vaughan was standing in the corner of the theater, looking appropriately relaxed. The keynote of the second 2015 Image Expo had ended 15 or so minutes ago and I was standing on the stairs, still lugging my backpack around and trying to look like I knew what was doing. Hovering on the edges of conversations looking for an opening is an art form I’ve mastered over the course of my 25 years and the Image Expo is a great place to put it to practical use. Vaughan and artist Steve Skroce – his collaborator on Image’s US-invades-Canada-with-giant-robots opus “We Stand on Guard” – were deep in conversation with some couple who weren’t buggering off anytime soon, so I waited on the stairs and continued to chat with Julie, the new friend I met at the Expo. I was unable to find an opening with Jimmie Robinson, who was at the middle of the theater speaking with some long-winded retailer and I had just suffered an exceptionally awkward encounter with Kyle Higgins (we both mistook each other for someone we knew). My conversation track record was off to a lousy start. Finally, those people were gone. Feeling that it would at least give me something to do, I approached the corner where Vaughan and Skroce were standing and extended my hand. “Mr. Vaughan,” I timidly uttered. “Ah, call me Brian.” He replied. We were off to a satisfyingly not-terrifying start, so I launched into the usual stuff I say when I meet people who create things I like. Usually this covers phrases such as “I love your work” and “Keep it up.” Those two things typically encompass everything you need to say to a writer/artist/musician/what-have-you. I wasn’t expecting Vaughan to ask me how I heard about his and Fiona Staples’ magnificent “Saga,” but I was delighted to inform him that the first trade paperback was an Amazon suggestion. “Well, thank you Amazon,” he said when I told him this. I felt really bad, because Skroce was just standing there in silence while Vaughan and I conversed. I was not familiar with any of his work, not having picked up “We Stand on Guard” #1, which was released the previous day. I promised myself to remedy this, and I told Vaughan and Skroce that I would get a hold of it. After listening to people talk and standing in line, waiting is the next most common activity at the expo. Image had set up a merch stand outside the theater where individual issues and trades could be purchased. Since I still had some time to kill, I picked up “We Stand on Guard” #1 and blasted through it in the lobby. It was…alright. It didn’t quite grab me the way “Saga” #1 (possibly the greatest first issue ever) did. Skroce’s art was splendid, but “Guard” looks like the type of series that has to grow on you. Due to some strict rules regarding the signing sessions, I was unable to get in on the panel Vaughan and Jason Aaron (the two expo guests I cared most about) were part of. This didn’t really go over well with me. Inside my heavy backpack was book one of the “Saga” deluxe hardcovers – purchased specifically for the expo – and my imposing “Punisher MAX” Omnibus by Aaron and Steve Dillon. These big books plus my issue of “Guard” were to be the stuff I got signed but I missed my window by a long shot (if you are at a con and want to get some stuff signed, get in line as early as possible). I had a chance to salvage some signatures at the after party, which I neglected to attend at my last expo visit. It was held in the seriously cool Cartoon Art Museum on Mission Street, which was a short walk from the Yerba Buena Center for the Arts, which hosted the expo. The place was crowded, hot and stuffy, though it was easy to locate Aaron, with his unmistakable Grizzly Adams-esque beard. He was in the very back, where the complimentary drinks were being served and where props and costumes from the Marvel movies were on display. Aaron was locked in a conversation circle with some people who may have known him; it was hard to tell in that place. Here I was hovering again. I had a glass of red wine on me, so I at least had something to do with my hands. Since the bar quite understandably drew the most traffic, I found myself frequently shifting around to let people get by. This was made much harder by the backpack. When I finally had Aaron’s attention, I shook his hand and started launching into the same talking points I covered with Vaughan. I felt very much like a gushing fanboy; I did just about all of the talking and Aaron just sort of absorbed it all. I’m sure he’s used to it at this point. Vaughan was at the front of the museum where it was coolest. He was chatting with more fans, signing a few books and posing in pictures. Seeing my opening, I got in the short line that formed near him and bummed a Sharpie from a gal in line and approached him once more. The awkwardness was pleasantly absent and he gladly signed my “Saga” hardcover and “Guard” #1. Feeling exceptionally bold, I lent my phone to the same kind stranger who lent me the Sharpie and she snapped a photo of Vaughan and I. Then I asked him some advice on how to get into comics writing. 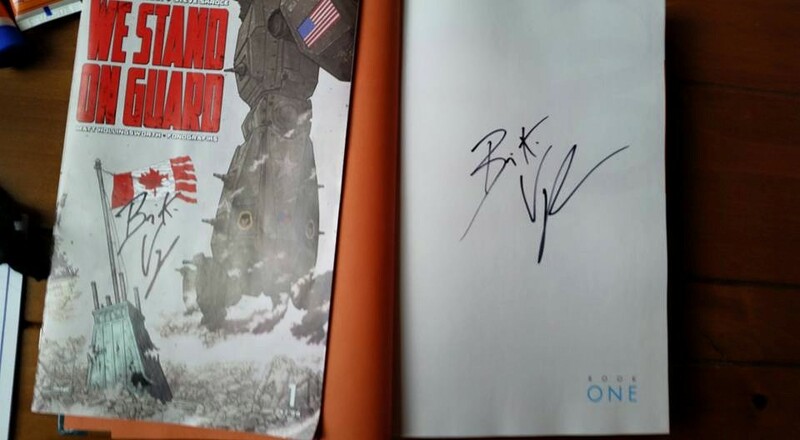 My copies of “We Stand on Guard” #1 and “Saga” Deluxe Edition Volume 1, both signed by Vaughan. Photo by me. “Do you mean like finding artists?” he asked. According to Vaughan, the best places to find artists are Twitter and DeviantArt and usually just shooting them a message is enough to grab their attention. But there is also a catch. “Here’s the part no one wants to hear,” he said gravely. “What is it,” I asked, with only a little bit of dread creeping into me. “You have to offer to pay them,” he finished. I was expecting so much worse than that. “That sounds entirely reasonable to me,” I replied. 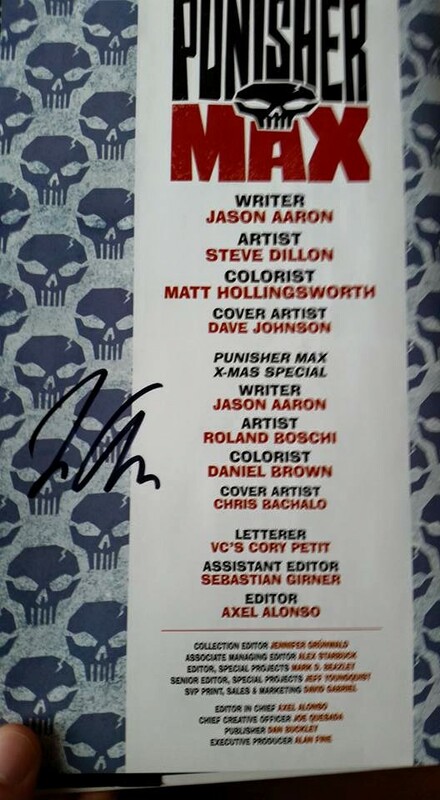 My copy of the Punisher MAX Omnibus, signed by Jason Aaron. Photo by me. My second conversation with Vaughan boosted my confidence immensely, so I promptly bummed another Sharpie from the cashier at the museum’s store and set out to locate Aaron again. I subconsciously used a rather cheap strategy to get his attention: I removed my Punisher book from my backpack, placed it under my arm and then strayed into his line of sight. Upon seeing me holding his book, he promptly approached me and I got his signature on it. Mission accomplished. I stuck around for only about 20 more minutes after that. I made sure to check in on Julie before I left. She had succeeded in meeting Greg Rucka and we congratulated each other on other coming our famous people fright. After exchanging a few more words, we parted ways and I exited museum. I had a long, traffic filled drive ahead of me, on account of the Fourth of July being two days away. It didn’t matter to me; this was the best Thursday I’ve had in a long while. Posted on July 8, 2015 July 8, 2015 by Kyle P Wise	This entry was posted in Comics and tagged Brian K Vaughan, Image Comics, Jason Aaron, Saga, San Francisco. Bookmark the permalink.